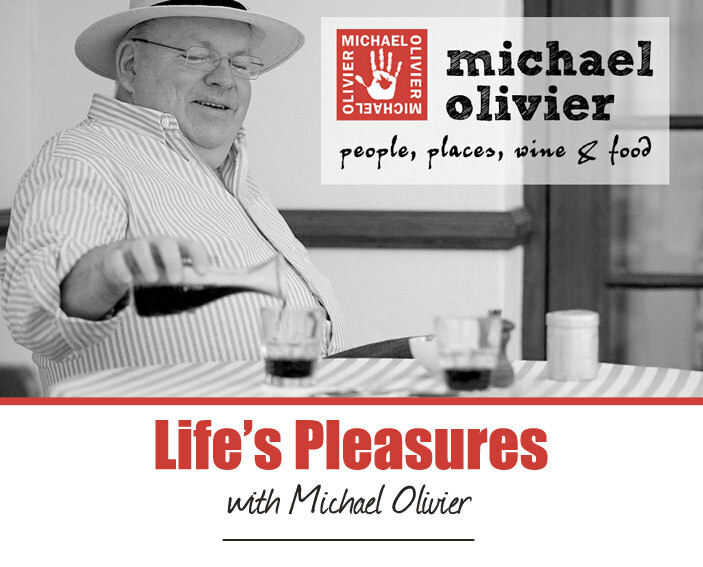 Michael Olivier, a well-known Cape food and wine fundi, shares his vast knowledge of all things wonderful. 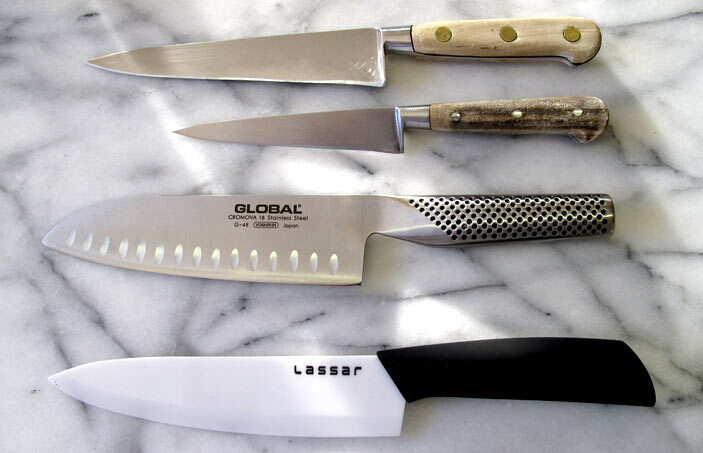 A good knife is as important to a chef in a commercial kitchen as it is to the home cook. And perhaps they are two different things. When I started cooking seriously back in the 1960s, I used a small bladed, wooden handle knife which I used for everything. It was only went I went to the Cordon Bleu Cookery School in London that I really became aware of the importance of knives, for boning, filleting, slicing. And this got me off building a small arsenal of some truly fabulous knives. In later years when I employed my own chefs in my restaurants, I was always surprised at the inventive ways in which they used knives. I had one chef – short little man - who would use the tiniest little knife to cut a huge pile of vegetables into the smallest dice for the various sauces we made. And then during dinner service, he would use a huge bread knife to slice the breasts of confit ducks! The first serious knives I bought were Sabatier knives. They are the ones at the top of the picture. Sabatier knives were de rigueur at The London Cordon Bleu School of Cookery. And 40 years later, although they now have new wooden handles, Madeleine and I use them every day in our home. We have a lovely little electric knife sharpener which keeps them beautifully sharpened. I chose to buy the stainless knives, as the mild steel knives tarnished very easily. Sabatier knives are made in Thiers, the cradle of the French cutlery industry. And then came the Lassar Ceramic Knife, the bottom one in the picture. Lassar Ceramic Knives are made of Zirconia - the second hardest material after diamonds and four times harder than stainless steel. Zirconia is also used in the space and aeronautic industries. The result is a razor sharp blade, that easily retains its original sharpness more than 10 times longer than steel. This alleviates the tedious task of putting the edge back on a knife on a regular basis as you have to do with steel knives. Ceramic does not rust and is more hygienic and easier to clean. Best not to put them in the dishwasher – in fact dishwashers are the most notorious of knife blunteners [if there is such a word] if not, I just made one up! My fishermen friends love this knife as the blade does not corrode with sea water and bait. I would think that this is really more for the home cook than the professional chef. But what do I know? I worked in a professional kitchen with a cute little short bladed knife with a wooden handle! And I use all three of these in my kitchen every day. Unfortunately known until fairly recently as “the workhorse of the wine industry.” It is a great unkindness to this, the most planted white grape variety in the winelands. Simply because it is resistant to disease, is so versatile and is used for the production of anything from the driest of ‘lite’ whites like the big selling low alc Drostdy Hof Extra Light, through semi’s and full sweets, bubblies to Axe Hill Dry White Port and the almost iconic Nederburg Edelkeur, Gunther Brozel’s botrytised Chenin which gave rise to all the Noble Late Harvests you see on the shelves today. Some serious players are the multi crowned Forrester Meinert Chenin - FMC - by Ken Forrester and Martin Meinert, anything by Teddy Hall, Jasper Raats from Rudera, Bruwer Raats, and Adi Badenhorst’s Secateurs. Great value Chenins come from Jeff Grier of Villiera and Paul de Villiers of Landskroon who produces a dry and an off dry. 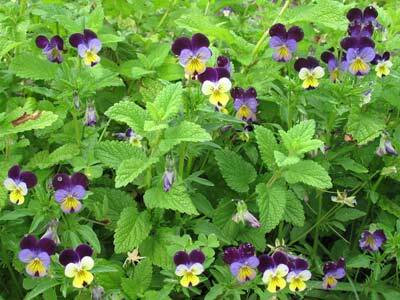 It looks: Clear and delicately coloured when young, moving to straw yellow and gold when older or sweeter. It smells: like ripe guavas or tropical fruit, melons and delicate honey and flowers. It tastes: White fleshed peach, apricots, guavas, melon and honey. It’s great with: Seafood and Thai food – or light summer chicken dishes. Score the fat of the bacon in a diamond pattern. Place the bacon into a deep ovenproof casserole. Cut the plums in half, remove the stones and place them round the bacon with the cranberries. In a small bowl mix together the remaining ingredients and pour over the bacon. Allow to marinate for at least two hours. Preset the oven on 200C. When ready place the casserole in the oven and cook for 30 minutes. Remove the lid and cook for a further 25 minutes. Remove from the oven and place the bacon on a dish to stand for about 5 minutes to rest. Meantime, remove the bay leaves and the star anise. Mash the plums into the sauce to make a chunky sauce. Add the jelly, squish it down to melt it and then shake the pot vigourously to create an emulsion in the sauce, you’ll find it absorbs any oil or bacon fat. Serve with steamed potatoes and a green vegetable like long stemmed broccoli or thin “French” beans. You really want to use Karoo lamb for this dish as we did recently. Lorraine and Guillau du Toit are our Karoo lamb suppliers. They farm in Williston, Lorraine says their sheep graze in sweet grass. The taste of their lamb – we choose two toothed hoggets - is as unique as the Salt Marsh Lamb from Harlech in Wales where they graze on salt marshes that have never been farmed in the modern sense, eating particularly one grass called sparta. Pré-salé - pre-salted - lamb that feeds on the salty marsh grass of the Bay of Mont-St.-Michel has put the town on the roster of France's 100 sites remarquables du goût - places with a unique local speciality. Preset the oven at 220C. Place the lamb on a board and lightly stab or score the fat all over. Season the joints with the salt and pepper and massage the seasoning in. In a lidded shallow oven proof casserole or oval roasting tin heat the oil and add the butter. Over medium heat, brown on the fat side, then turn fat side up and brown on the underside. Tuck in the garlic, thyme and the shallots or pickling onions. Pour in the wine and the water, sprinkle with the herbs and bring the liquid to the bubble. Put in a 220C oven, uncovered and roast for 30 minutes. 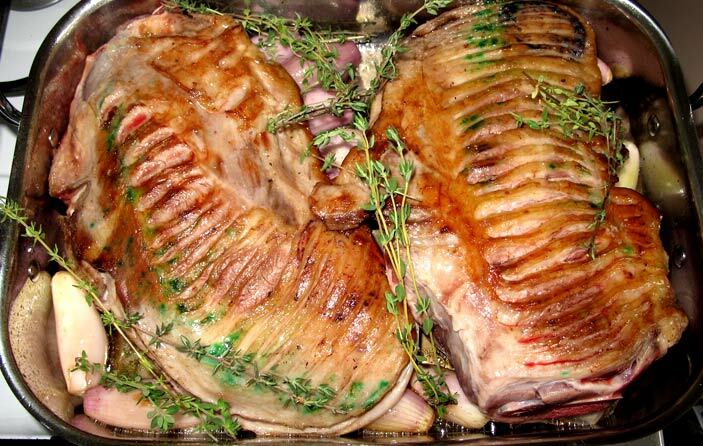 Then turn down the oven to 150C, cover the lamb with foil and braise for 2 to 2½ hours, or until so tender that the meat will fork easily from the bone. Now, if you have the time, allow it to stand overnight and next day, remove all the fat from the surrounding sauce. Reheat carefully in a 180C oven. Or simply spoon the excess fat off the top, reduce the sauce, season well and thicken with beurre manié – equal quantities of room temperature butter and flour kneaded together. We are great believers in using quality wine in cooking. 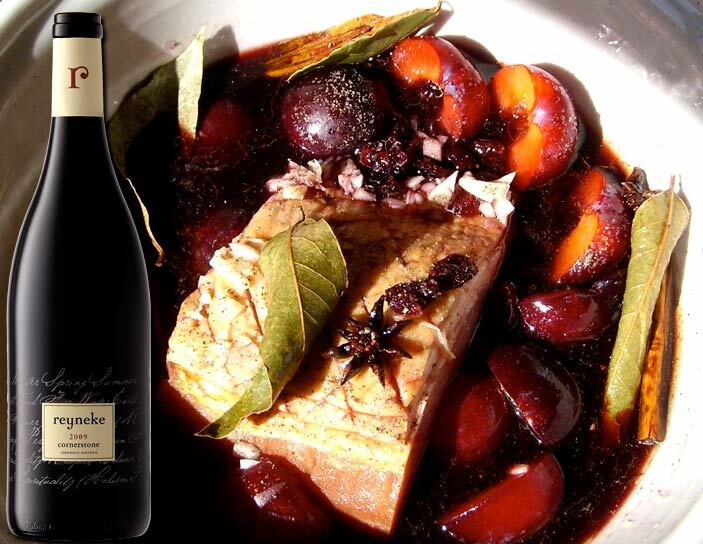 As this is a rustic dish, we chose Diemersdal Grenache 2011 as it was our wine of choice to drink with it. Michael Olivier gathers up some books for your beach bag this festive season. Some easy and amusing reads to while away the hours. He also suggests a suitable wine to go with each. Books no 1 – a pair from the Penguin African Writers series. Penguin Books recently launched an African Writers series. I was very pleased to read a Ben Okri novel, Dangerous Love. Okri is a Nigerian writer of major international repute. His use of language is brilliant and though slow moving, perhaps this is an African thing, the leisurely pace of life, it is a fascinating picture of the life and times of Omovo, and office worker and artist. Okri is able to conjure up the most complete of pictures in one’s mind of Omovo’s life in the compund with his father and step mother, and his ill fated love affair with the beautiful Ifeyiwa. Anyone who reads the fictitious Ben Trovato’s column in the Sunday Times would love to have this amusing reminder of columns past. However, should one wish to use The Whipping Boy for nothing more than the simple pursuit of reading pleasure, one will be pleasantly surprised to discover that the book contains more than just a compilation of Trovato's much-loved and widely hated columns. Scattered among these literary vipers, like shrapnel from fragmentation grenades, are a bunch of fake news stories, hilarious letters to the rich and famous and outrageous job applications that resulted in the author receiving not a single offer of employment. I recently spent a happy weekend in Prince Albert at the African Relish Cookery School. My wife and I had gone there to work with Sonia Cabano who was launching aptly named Relish, a book without which you should not be in the kitchen. I did some wine workshops and introduced the guests to some new and different wines. It was huge fun, the weather was sublime, and what really enchanted me was the wonderful flowers which were blooming at the school and in the village. So this piece is more about the flowers than anything else. I was so happy to see a Cup of Gold again. We had a creeper which grew all over one part of the farm house in which I grew up and it has been years since I last saw one in bloom. In the main street, I came across this profusion of white Iceberg Roses. 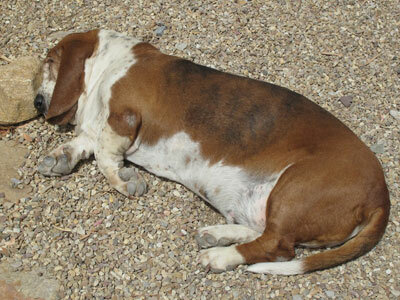 A bit further down the road, outside William and Colleen Penfold’s The Prince Albert Trading Store, their Basset was taking an early morning nap. He was in a coma. 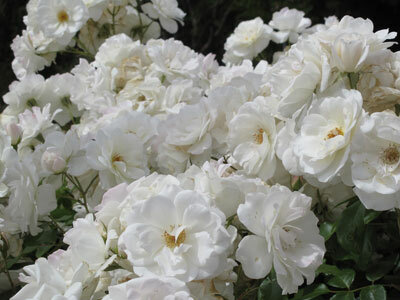 The garden of African Relish has some wonderful roses in it, some old English blooms as well as variegated ones. In the herbaceous border of the herb garden at African Relish, I came across these Johnny Jump Ups – the cutest multi-coloured pansies. My grandmother used to use them in her garden and they self seeded each year, hence the name! 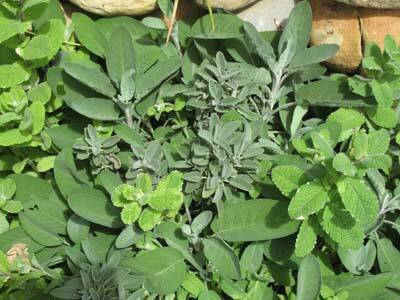 Sage and mint enjoy the sun in the herb garden. Right outside the main demonstration kitchen was this Loquat tree, just bursting with fruit. Another childhood memory for me as my father had planted a row of trees in front of the wine cellar on our farm to keep the cellar cool in summer. 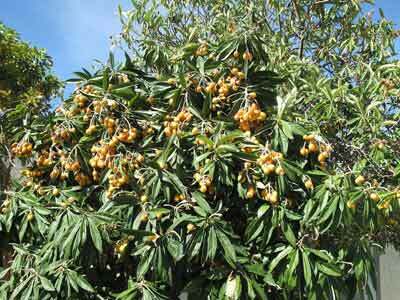 As a result, there were always lots of loquats for us to eat as children in the Spring. There is a diary of the weekend, filled with more information in my online digital magazine Crush! Crush! is a finalist in this years global Digital Magazine Awards. In my trios to Portugal, I have eaten some delicious foods, not least amongst them the very ugly but utterly delicious goose barnacle. Quinces are called marmelos in Portuguese, and a sublime thick paste is made from them called marmelada. In fact the word marmalade comes from the same root word. Travelling in Portugal I often find this on a cheese table, sometimes made with guava, and it makes a perfect companion to cheese and a glass of delicious wine. I ate this with sheep’s cheese and fruited bread in the wine region of Setubal where the moscatels rule. I was in the Orange River Wine country recently where some of the Muscadels and Jerepigos are so delicious, I was reminded of my Setubal experience of marmelada. Preheat your oven to 180C. Peel the quinces and place them in a glass or stainless steel baking dish and pour round some water to come up to the half way mark on the quinces. Cover the dish, either with its own lid, or with aluminium foil. Place in the centre of the oven and bake for three hours. Allow to cool completely. Scrape the pink flesh off the core, making sure you leave all the pips and hard pieces behind. Place the quinces in a stainless steel saucepan with any juice, ad the white sugar. Bring to the boil and reduce the heat to very low and allow the mixture to cook very gently for an hour. Be careful to stir regularly to prevent sticking on the bottom. The marmelada will take on a deep brick red colour. It is a good idea to line some teacups with siliconised baking paper and o pour the marmelada into them or you can line a baking tray and pour it in a single slab and cut it into slices when it is cold. Either way, if well wrapped in paper and cling wrap, the marmelada will keep in the fridge for up to a year, but it wont last that long as it is so delicious. 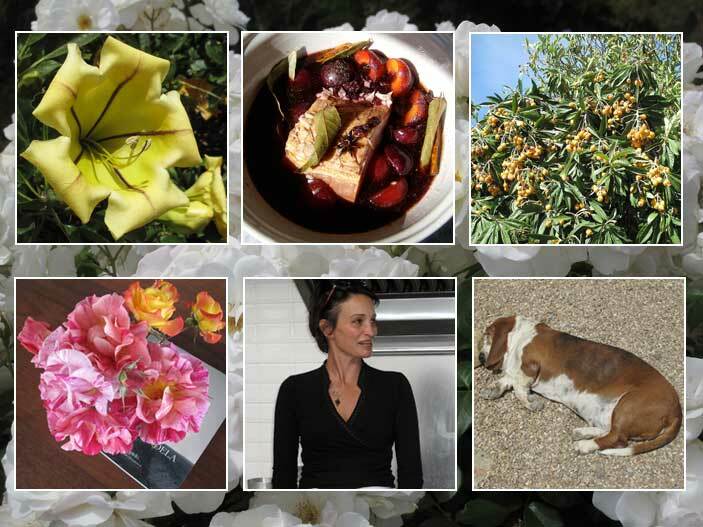 When my wife Madeleine and I ran a restaurant called Parks in Constantia in the 90s, a friend Christine Stevens had a property in Constantia on which she grew organic vegetables. Whenever she had a little glut, we and, by extension, our guests, enjoyed the produce of her garden. Lucky us. 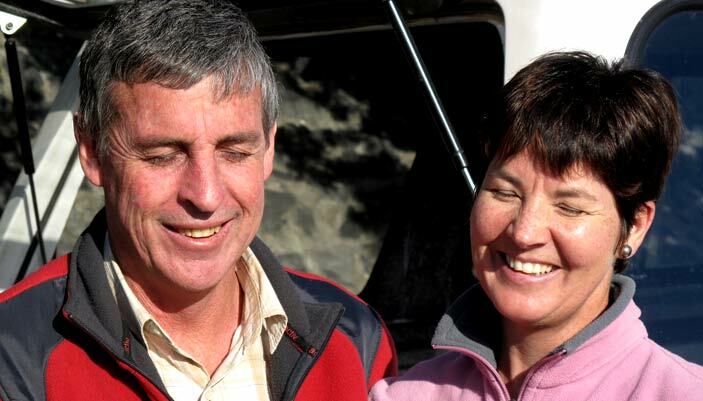 Times have changed, we no longer run a restaurant and Christine and Mark took their family off to Mountain Oaks Winery in the beautiful Slanghoek Valley where they make the most sublime of wines and grow organic vegetables, almonds and all manner of wonderful stuff. The grapes for the wines are organically grown, they even plough their vineyards with horses in order not to compact the soils and allow for the underground insect life to work their magic. During Winter Christine interplants her vineyards with broad beans. This means, she has a wondrous supply of beans and the horses can plough the plants back in order to nourish the vines. So this week we got lucky and Christine rang our doorbell and brought us a basket of beans. And a bottle of her sublime Mountain Oaks Chardonnay 2008 Reserve. What to do with the beans? I had a couple of rolls of Fairview Chevin. Having made frittatas in Cape Town with the well-known British TV chef Alistair Little, I used this recipe from my first book which I made up as a loving thought to Gabrielle Kervella, a friend of mine in Western Australia whose eponymous Goats cheeses have been a legend in Australia for over 25 years. You’ll need: 250g freshly podded baby broad beans [you can use peas], 1 onion – thinly sliced, extra virgin olive oil, 150g fresh firm goats cheese, 4 eggs, 4 Tbs chopped fresh parsley, sea salt and freshly ground black pepper. Method: Bring a pot of lightly salted water to the boil and poach the beans for about 8 minutes, drain through a colander and allow to get dry. Meantime in a non-stick frying pan fry the onions in a generous amount of olive oil – this will add another dimension of flavour so use a good oil – until a good golden brown. Beat the eggs and parsley with a whisk and season generously with sea salt and freshly ground black pepper. Slice the cheese into thick slices. Put the beans on top of the onions and season, place the cheese slices on top of the beans. Pour over the egg and cook, pulling in the edges as you go along. Allow it to become quite golden brown underneath. Slice the frittata into about 6 slices and then carefully turn each slice over to brown on the other side. If you find it easier, you can pop the pan under a hot grill to cook the top. Serves 4 as a starter with some chunks of crispy bread, or two as a supper dish again with the bread and a leaf salad containing some wild rocket. 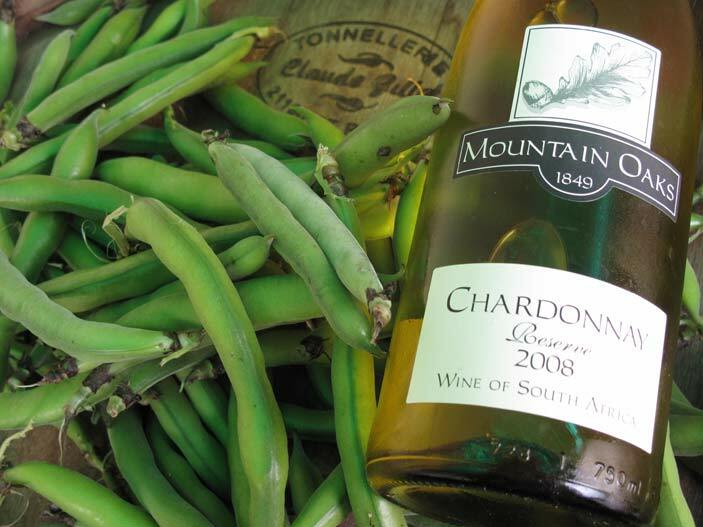 Get out a corkscrew and open a bottle of Mountain Oaks Chardonnay Reserve 2008! Waterblommetjieredie is a great tradition in the Cape where waterblommetjies, [Aponogeton distachys] also know as wateruintjies, fill the ponds and dams in the Western Cape with pretty white snowdroplike strongly scented flowers. Louis Leipoldt, in his book on Cape Cookery, refers to them in English as Water Hawthorn and Myrna Robins as Water Hyacinth. 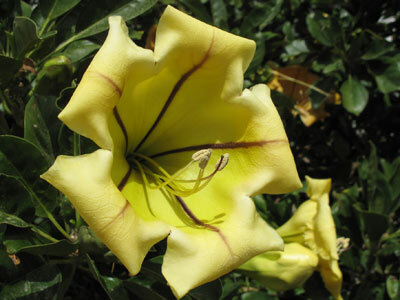 It is important that the flowers be just opening with the calyces still bright green. To prepare them, remove any of the black centres of the flowers. They need to be soaked in lots of salted water and then rinsed through well in a couple of basins of freshly drawn water. With waterblommetjies in season and available in most supermarkets now, I thought that a recipe which did not require the length of time a bredie does to cook, might appeal. Wash the waterblommetjies very carefully as suggested above. Steam over hot water until cooked through. Set the oven at 180C. In a large bowl, mix together the two meats. Flavour with the lemon rind, half of the finely chopped parsley, sea salt and freshly milled black pepper. Form into balls and place in an ovenproof dish. 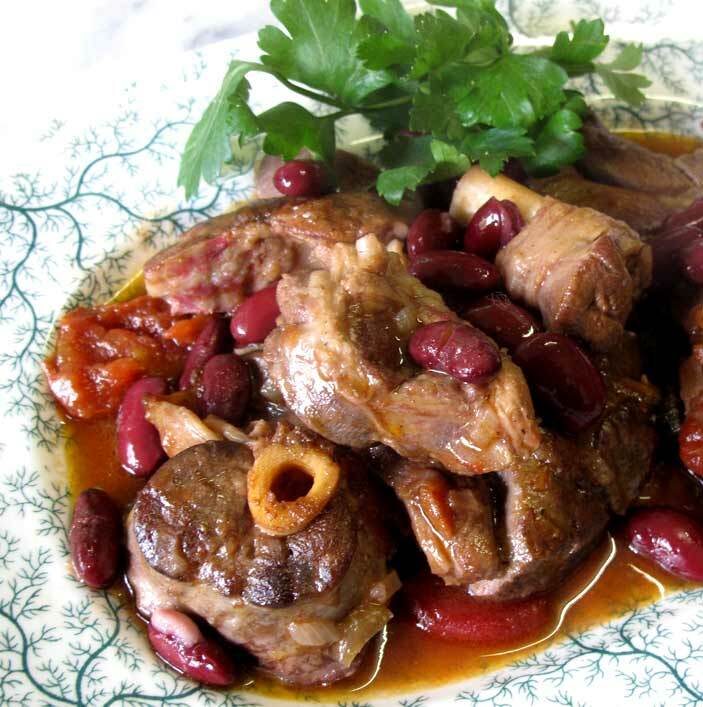 Pour round the lamb fond and place in the oven and cook till well browned on top – should be about 40 minutes. In a bowl, whisk together the lemon juice, cornflour and the egg. Season with sea salt and freshly milled black pepper. Pour over the egg mixture and whisk well. In a small saucepan heat the sauce until it thickens slightly. Pour over the meatballs, place the waterblommetjies on top, cover and reheat in the oven for about 10 minutes. Serve with pasta rice or steamed white rice. 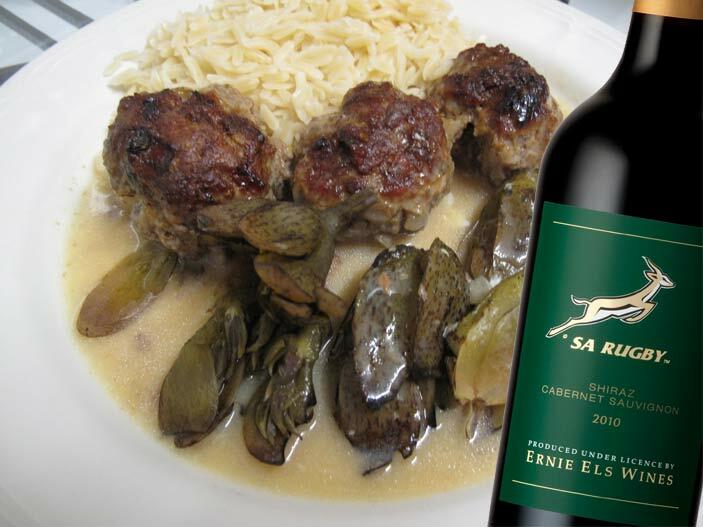 You want to serve this with a hearty red wine like the Ernie Els SA Rugby Shiraz Cabernet Sauvignon 2010 of which Winemaker, Louis Strydom, says: “Brightly tinted with a purple edge, this wine glistens in the glass. Produced from our superlative 2010 vintage, the strong Shiraz component adds spiciness and Cabernet Sauvignon the richness.” Expect a vivid display of complexity with layered cinnamon, fynbos, liquorice and sappy red berry fruit. 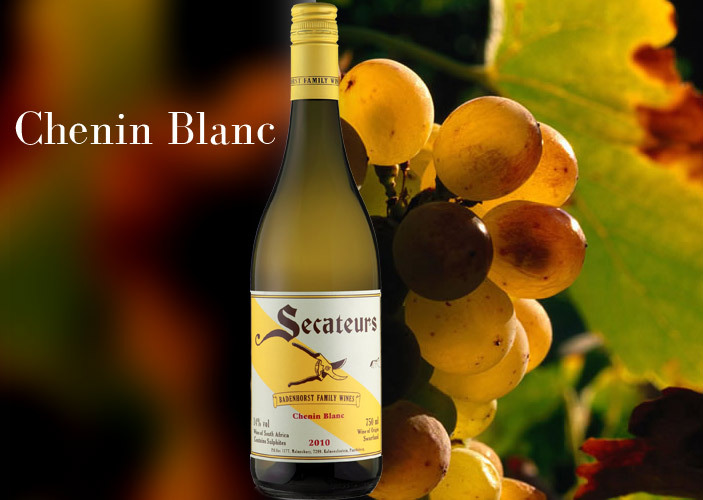 Exotic and energetic now, this wine will improve in the cellar. Don’t put it in your cellar drink it while watching one of the Rugby World Cup matches – go Bokke! 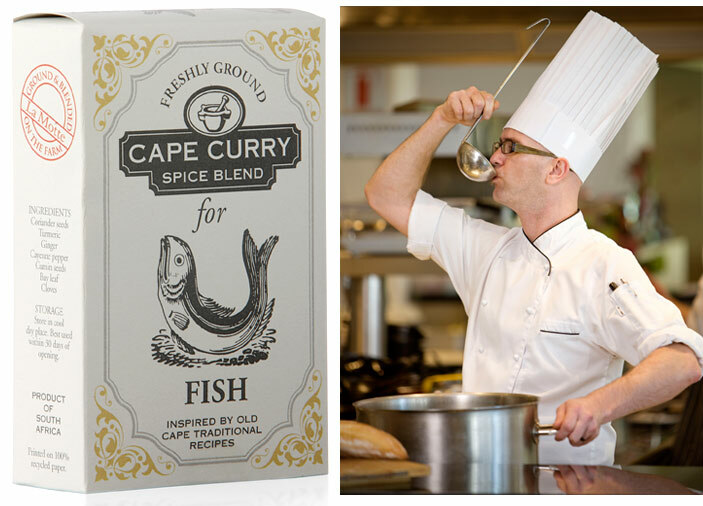 And in the early days of the Cape, it is speculated by Dr Hettie Classen in her book, Die Geskiedenis van Boerekos, that it was the Dtuch who brought the spices to the Cape when they first arrived here in 1652. They had for years before been buying spices from the East through Italian traders who in turn brought them from Eastern traders who had brought the spices in camel trains along the well known trading routes, the Silk route being one of them. Cook the fish two days ahead of requiring the dish. Pat the fish dry and dip into the seasoned flour. Fry in the hot oil for about 4 minutes on each side or until golden brown and cooked through. As the fillets are cooked, remove and drain on kitchen towels and allow to cool. If desired, the fish can be brushed with oil and baked for about 25 minutes in an oven heated to 180�C. My grandmother was passionate about Ginger, On the sideboard in the dining room, there stood, on a saucer, surrounded by long tined pickle forks, a blue and white Chinese Ginger jar full of lumps of candied ginger. After a meal. She would go over, poke about in the jar with a fork ad extract a large lumo of ginger. She would pop it in her mouth and chew away with tears streaming down her face. Method : Preset the oven at 120C. Whisk the egg whites in an electric beater till they form soft peaks. Add the sugar, vinegar, the seeds from the vanilla pod and the corn flour and mix for a further minute. Spoon four large egg shapes onto non stick baking. Bake in the preset oven for about 40 minutes until the outside is crispy and the centre is still soft. Leave to cool completely. When cool these can be stored for a short while – a day or so - in an air tight container. 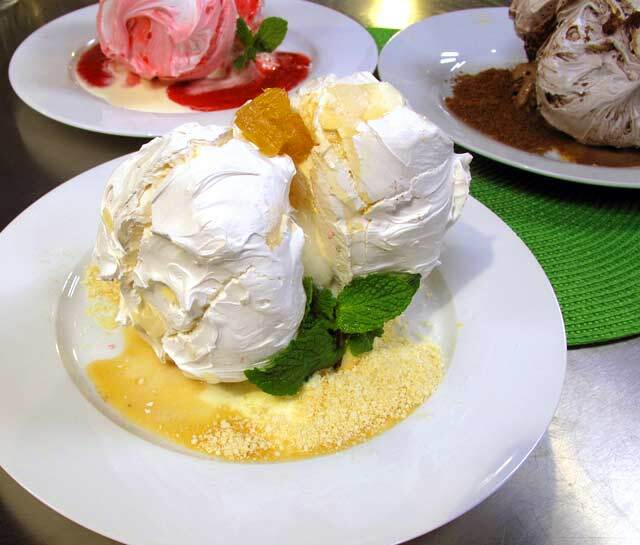 For Vanilla and Ginger Meringues you will need Vanilla Ice Cream and Oudemeester Ginger Liqueur. On Saturday, November 11, Phillips held the Heuer Parade auction in Geneva. It was a sale of 41 vintage chronographs from the tag heuer replica collection. In an article published a day before the auction, we offered a comprehensive guide to the watches and a bit of context for the auction overall. Today, we consider the results of the sale and how they may impact the market for Vintage TAG Heuer Replica Watches going forward. I asked the Pick n Pay butcher to slice the lower part of the lamb leg for me into thickish slices. Preset the oven at 200C. Dip the meat into seasoned flour and brow in and oven proof casserole on all sides, a few pieces at a time. Set aside on a plate. When done. Add a little more oil to the casserole if necessary and in it fry the onions until lightly gold in colour. Add the carrot and celery, stir fry for a while and the add the garlic. Pour in the tomato and the juice, add the stock and the red wine and bring to the boil. Return the lamb to the casserole, season lightly with the sea salt and freshly milled black pepper. Add the bay leaves and push the meat below the surface of the liquid. Seal and put into the oven for 30 minutes. Drop the oven temperature to 150C and cook for a further 90 minutes. By this time the meat should be tender. If not, cover and cook for a further 30 minutes. Add the beans and heat them through. Serve with mashed potato or steamed white rice and a selection of vegetables. #wineoftheday Van Loveren Red Muscadel 2010 Essence of sunripened raisins, honeysweet, nicely integrated spirit. Herman Charles is happy. #wineoftheday Spier Creative Block 2 2010, happy memories of the best of Margaret Rivers similar Sauv/Semillon offerings. Great white, Frans. #wineoftheday Domaine Grier Rosé 2010 Sud de France Grenache 75% & Carignan, delicate pink, delicate aromas, delicate berries & minerals. #wineoftheday Van Loveren Neil's Pick Colombar 2011. Off dry quaffer, tropical litchi and windfall guava. Crisp and fresh and zingy. #wineoftheday Porcupine Ridge Syrah 2010. Big boy, powerful, silky soft, raspberries, mulberries, cherries, fennel, dark chocolate on aftertaste. C Louis Leipoldt, who lies at rest in the Pakhuis Pass north of Citrusdal, was a major figure in the Afrikaans literature. So much a character of his time, this poet, playwright, journalist, chef, botanist and medical doctor, is perhaps most of all remembered in my mind as one of South Africa’s most important food writers. His regular articles in Huisgenoot, Polfyntjies vir die proe, which he wrote right up to the time of his death on 1947, are real pictures of the Cape, filled with interest and much amusement. Of his food essays, I found Jakkalskossouffle one of the most amusing. Paul Murray, History Master at Bishops and editor of some of Leipoldts major works introduced me to the real delights of Leipoldt and we held two Leipoldt occasions a couple of years ago, one at 96 Wienry Road and one at The Cape Grace. We served dishes from Leipoldt’s books, I read some of his more amusing stuff and Paul spoke very eruditely of Leipoldt the man. We thought at one time of writing a book using some of Leipoldts original recipes which are very short on description for a man who trained under August Escoffier in London. Writing the book was not to be, but here is an amusement for you. Leipoldt’s recipe for tomato bredie and mine. "Tomato bredie must be a well-spiced tomato purée, surrounding tender bits of meat magnificently impregnated with its flavour. It must not be too watery, and it must never, never be greasy, so when the lid is taken off the pot for the open evaporation cooking for the last couple of hours, all the superabundant fat should be artfully skimmed off, without removing any of the essential gravy. When properly made it is a magnificent dish, always to be served with white rice and boiled potatoes. Tomato bredie. Peel two pounds of ripe tomatoes by plunging them into boiling water and removing the thin skin, cut them into quarters, add a couple of green ones. Take two pounds of thick rib of mutton, as fat as you can get; cut it up into neat slices; dry and dust with flour; put it into a shallow saucepan with a pound of sliced onions, three sliced leeks or shallots, half an ounce of green ginger, a few cardamoms, coriander seeds, peppercorns and fennel seeds, and crushed thyme, marjoram and garlic leaves. If you like the bredie to be hot, add a crushed chilli and plenty of black pepper. Braise all this with sheep fat and when the meat is nicely browned, add the tomatoes; cover closely and let it simmer for several hours, very slowly, shaking frequently. Then add salt to taste, a teaspoonful of chutney sauce and a tablespoon of moist sugar, and let it simmer for another couple of hours, with the lid off, till it is thickened. Finally add a glass of wine and serve." In a casserole, on top of the stove, brown all the meat, a few pieces at a time in the oil over medium heat. Remove the pieces with a slotted spoon and drain on kitchen paper. Fry the onions very slowly in the oil for a while, then add garlic and ginger and fry until golden. Add a little more oil though only if necessary. Just before they are done, add the cardamom, coriander, peppercorns, fennel, thyme, marjoram and chili. Stir-fry for a short while. Pour off any excess oil before continuing. Return the meat to the casserole and season lightly with sea salt, freshly ground black pepper and nutmeg. Add the stock and the tomato juice and cover. Braise gently over low heat, checking for burning or in a 180C oven for an hour and a half. Remove from the oven. If you have the time, cool quickly and refrigerate overnight. This is an important step to mature the flavours. It also gives you the opportunity the following morning to remove the cold solidified fat of the top and helps to tenderise the meat and makes it cook faster the next day. Next day, reheat the casserole gently in a 180C oven before adding the roughly chopped tomatoes and potatoes. Simmer gently for one and a half-hours or until the meat is tender. Stir gently to mix through well. Add the chutney and brown sugar; reseason with salt and freshly milled black pepper if necessary. Serve this with a Pilaff of Basmati rice and some of Mr Leipoldts green beans. 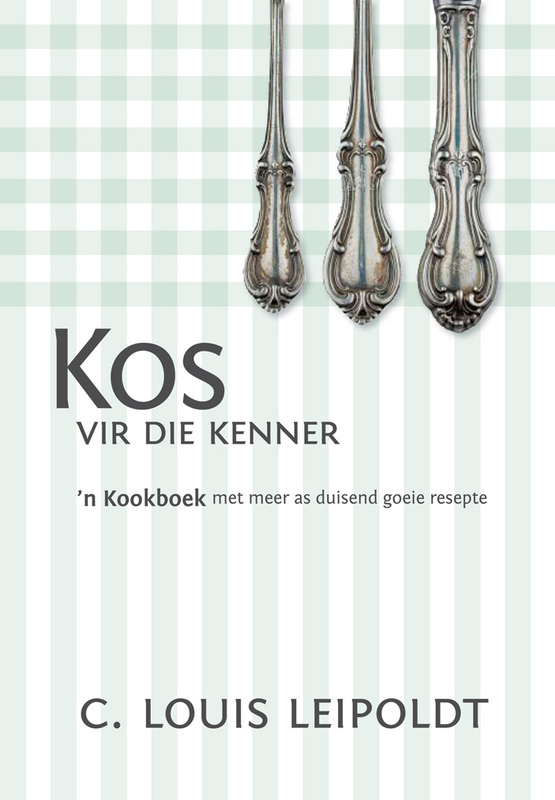 Leipoldt’s Book Kos vir die Kenner has been recently republished by Human and Rousseau. It is a gem of a book. If you are remotely interested in food, buy it, it’s a great read. And it’s filled with more than a thousand recipes. #wineoftheday Kleine Zalze Chenin Blanc Vineyard Selection 2010. Johan Joubert turns out a great Chenin, full ripe rich, superb use of oak. #wineoftheday Sadie Family Wines Niepoort Cape Fortified 2008. Magical Douro like "Port" made by Dirk Niepoort. Dry, sumptuous fruit/spirit. #wineoftheday Eikendal Chardonnay 2010. Majestic windfall citrus fruit, beautifully oaked, noble acidity. Perfect balance. Lekker mouthful. #wineoftheday Bouchard Finlayson Galpin Peak Pinot Noir 2009. Majestic oak & cherry berry fruit on nose. Fabulous 'sweet' berries on palate. #wineoftheday Barefoot Moscato from California at R29 from Pick n Pay, great value, great flavour, sunripened raisins, lemonsquirt ending! #wineoftheday The Foundry Rousanne 2010. What a fabulous wine! Such bags of flavour, ripe stone fruit, riverstones and minerals. Yummy! #wineoftheday Nederburg Chardonnay 2009. Great white stone fruit, great use of oak, easy to drink, great Winemaker! TARIRO YOYOYO! When the heading on the menu is The Fantastic Eben, Adi and Luke show and there are some 11 courses on it with at least 10 wines with which the courses are specifically matched, you kinda know this is not lunch. When you have the winemakers present to tell you about their wines and the winemakers are two of the most off the wall, out of the box, passionate creators of some of the most extraordinary ‘extreme’ one barrel only ‘from a vineyard planted in 1905’ wines, you kinda also know that you are in for some kind of once in a life time experience. When you have one of the most quirky, passionate, professional kitchen teams, under their leader, acclaimed chef, Luke Dale Roberts cooking lunch in front of you, you kinda know that this is not to be a ‘bord kos’ lunch. For here is cooking on the edge, and for me it’s the edge that makes the whole thing so exciting. Since opening in November last year, Luke has been wowing diners who managed to get a booking at this hard-to-get-into culinary hotspot. His restaurant is the epitome of creative and innovative cuisine and now that it’s winter and Cape Town is quieting down, the locals can venture out to enjoy Luke's latest offerings from his new winter menu. And this winter Luke will allow some of the country’s winemaker rock stars to join him behind the kitchen counter where there will be experimentation, fun and plenty of wine. This experience in food and wine, for it is not a meal it is a gastronomic adventure, will continue The Test Kitchen’s reputation of being at the forefront of exciting fine dining and will highlight the symbiotic relationship between good food and wine. Every 6 weeks, new menus will be created to showcase new wines and possibly even some of the best from the microbreweries, all aiming to thrill and inspire new creativity with respect to food and wine and how we enjoy it. Don’t even think about it – get thee hence! 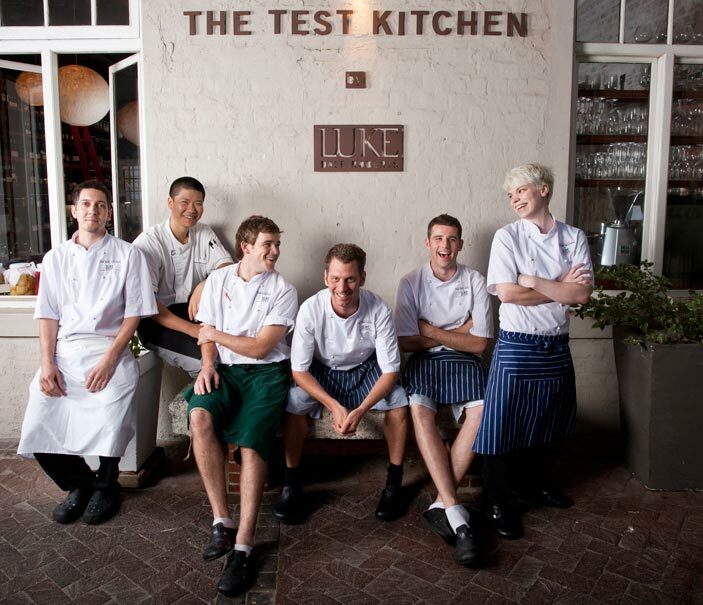 For reservations and if you need to know more, visit www.thetestkitchen.co.za or call 021 447 2337. I follow Luke on Twitter: @ldrchef. The Test Kitchen is open for lunch and dinner from Tuesday to Saturday. The 11-13 course menu includes wines is priced at R850 per person. Let me tell you – it’s a steal at the price. Prior booking is essential. These are my “Wine of the day” of the day tweets. If you would like to receive them daily, follow me, my Twitter handle is FoodWineGuru. #wineoftheday Kleine Zalze Family Reserve Sauvignon Blanc 2010. Sappy and full with Granny Smith apples and green figs. Mixed Origin grapes. #wineoftheday Uitkyk Cabernet Sauvignon Shiraz 2006. Delicious dark fruit and berries. Gentle grippy tannins. Ribeye steaks on the braai! #wineoftheday Carbon neutral Bartinney Cabernet Sauvignon 2009. Made by Therese de Beer, Cassis, lead pencils, beautifully oaked. Stonker! #wineoftheday Bob's your Uncle from The Boer and Brit. Sappy soft red & black berries, blood plums. In 500ml beerbottle, crowncork. #wineoftheday Tamboerskloof 2007. What fabulous depth of sweet fruit, perfectly managed oaking, gentle ripe tannins. Dark and divine. Now there is nothing more comforting on a cold night than an oxtail casserole. 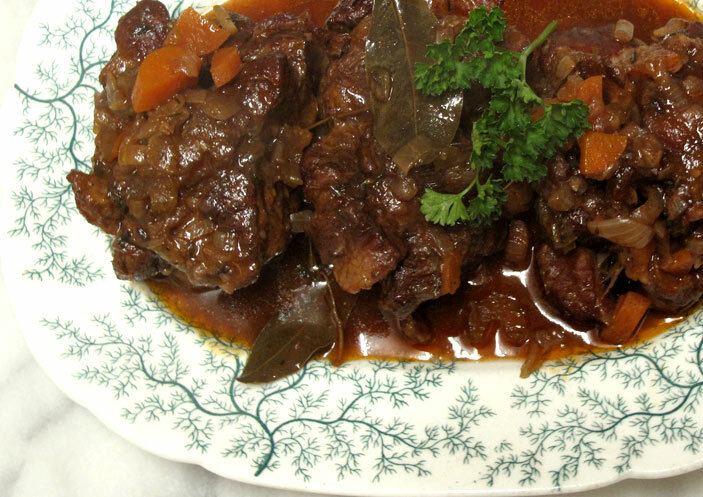 And fortunately oxtails are now making their seasonal appearance on the supermarket shelves. Where are they all summer? Or do we slaughter only tailless beef in summer. Or do we freeze them all for Winter. This is a simple winter casserole with bags of flavour, easy to prepare. If you have any sauce left over, flake off any meat there might be on the odd piece of oxtail. It makes a lovely sauce with pasta. In the preparation, it is quite important to chop the vegetables quite finely for maximum flavour and they also add texture to the sauce. Also add a sprinkle of sweet smoked paprika to the seasoned flour for extra flavour. I have started sending out a “Wine of the day” of the day tweet and thought you might like to choose a wine from this selection to drink with your oxtail. If you would like to get it regularly, follow me, my Twitter handle is FoodWineGuru. #wineoftheday Cardinal Vanity Pinot Noir 2007. Elegant stuff, Burgundy barnyard nose, forest floor mushrooms & vibrant black Dijon berries. #wineoftheday Bosman Family Vineyards Optenhorst Chenin Blanc 2009 Redolent of Granny Smith Apples & undertow of cooked oats. Delicate oak. #wineoftheday Lammershoek Lam Rosé, made from Shiraz. Beautiful pink, delicous sour cherry flavours. Dry food wine. #wineoftheday Obikwa Moscato - 7.56% abv. Lovely Sunday lunch wine, overtly muscat, tad sweet, crisp ending. This one will go down a treat! #wineoftheday Simonsig Chenin Blanc 2011 - 43rd vintage of this wine. Benchmark Chenin, fruity, white flowers, guava, fynbos honey. ALIVE! Less than two hours later, this wonderful picture arrived by email. It reminded me so much of the tomatoes my grandmother grew in her vegetable garden. We always had fresh fruit and vegetables when we were children. Often we would – as a supper dish – have tomatoes like this, just with fresh home-baked bread, farm butter and salt. Often too we would have a cheese and tomato sarmie. In adulthood, we made what we called “The Ultimate Cheese and Tomato Sandwich.” This is the quintessential South African sandwich. You will not find a coffee shop or snack bar in South Africa, which does not serve a Tomato and Cheese sandwich. There are minimum requirements for my ultimate cheese and tomato sandwich. Fry some finely chopped onion slowly in butter until caramelised and cooled to room temperature on kitchen paper. Have ready an excellent bread knife – it’ll do for both the bread and the tomato. You’ll need fresh soft white bread, preferably homemade with bread flour rather than cake flour, in a large loaf tin, which will give you a large sandwich! 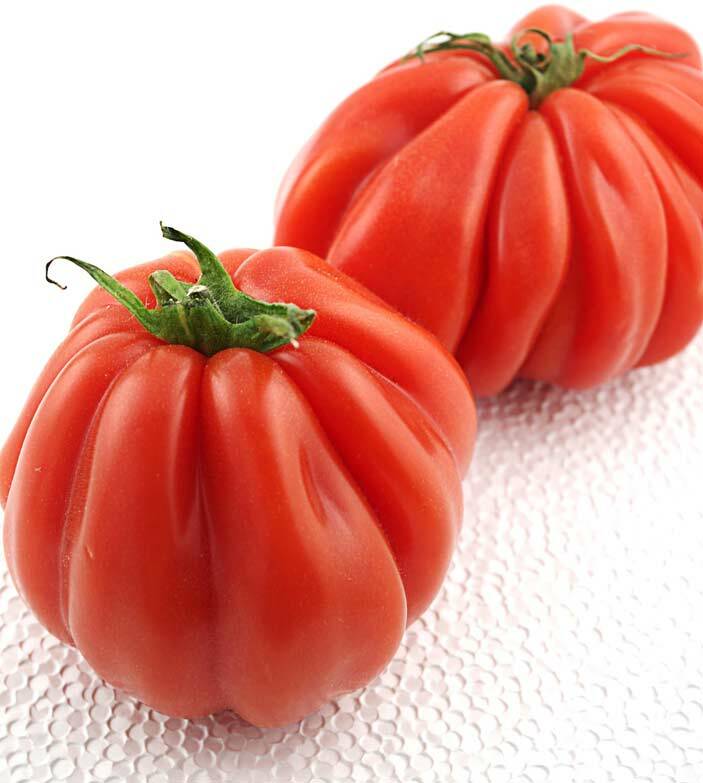 Tomatoes are important, vine ripened in the sun to the point of perfection, plump and firm for easy slicing. The cheese? My best choice would be Rob and Petrina Visser’s Huguenot from their pasture fed Jersey herd in Klapmuts. It has all flavour elements you want to complement the ripe tomato. For the construction, cut two slices of bread in medium to thick slices and spread with soft unsalted butter. Thinly spread over some onion. Slice the tomato thinly and layer it generously over the onion, season well with hand harvested sea salt and freshly milled black pepper. Top with torn sweet basil leaves and pile on the grated cheese and top with the other slice of bread. Slice on the diagonal and serve with rocket dressed with verjuice and olive oil of the extra virgin kind. You can of course put it on a sandwich press and toast it before slicing. A treat we have on occasion when we have a barbecue is to make up the sandwich and tie it in a little parcel with some sewing cotton and when the coals are cooling, lightly toast the sandwich on both sides. This will cause the cheese to melt slightly and ooze out the sides. Yum! A glass of good red wine like the Landskroon Paul Hugo Red, would be a perfect partner. I really love foods and drinks that have a story. Far rather a crumbly zesty slice of aged Huguenot Cheese from Petrina and Rob Visser of Dalewood in Paarl than a hunk of bright yellow that is better suited to making a toasted cheese or Welsh Rarebit. Far rather a slice or two of wood smoked dry cured bacon than something that exudes water when you put it in a pan. Far rather a shot of Cointreau, produced by the family of the same name than some cheap and cheerful bright orange concoction masquerading as a citrus liqueur or a tot of Drambuie, whisky from the Highlands of Scotland, flavoured with heather honey. 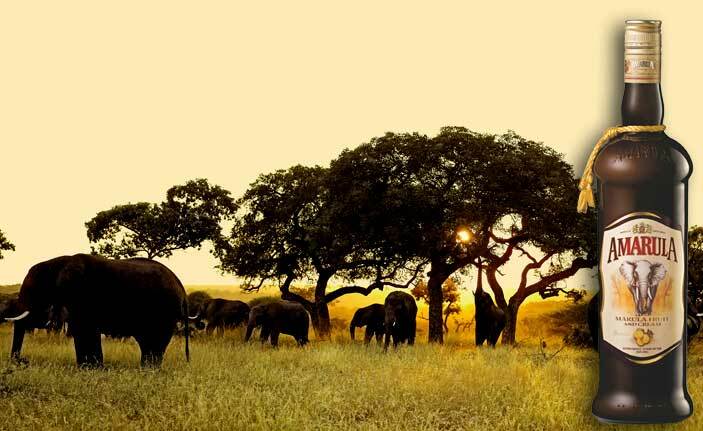 The story of an original South African liqueur, Amarula, is a really romantic one. In February, at the height of summer in the sub Saharan plains of the north eastern reaches our country, the fruit of the marula trees ripen. And the elephants move in to eat them. The massive female trees bear the most delicious yellow skinned fruits – up to 2 tons of fruit per tree – enough for the elephants and the distillers. Teams of ladies move in and gather the fruits and the process begins. The fruit is relieved of its pip and skin and crushed. The flesh is fermented in much the same way as grapes are for fine wine. 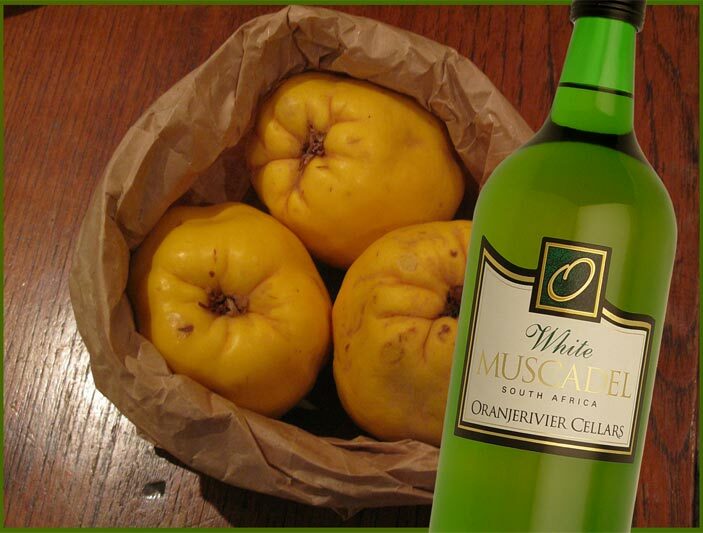 The resulting marula wine is then double distilled for purity and matured in small French oak casks for up to 24 months. Once the wine has matured, it is blended with fresh cream to create the unique and rich flavour that is Amarula – one of the biggest selling cream liqueurs in the world. Adding to the romantic tale of the origins of this utterly delicious cream liqueur is that the single-stemmed marula trees are topped with dense and spreading crowns, are known by some communities as “marriage” trees. Growing only in the sub-Saharan wild, they often provide the focal point for ritual and cultural activities amongst villagers, and weddings conducted beneath their ample shade are a regular sight. Amarula is available in bottle stores nationanwide and also in the duty free shops at the International airports, making the liqueur an ideal gift to take to friends overseas. This weekend I did - I made my first pot of yoghurt. I have a friend, Sophia, who grew up in Douglas in the northern Cape. She is of Lebanese extract and learnt a huge amount about food from her Lebanese grandmother – and the Lebanese know about food. 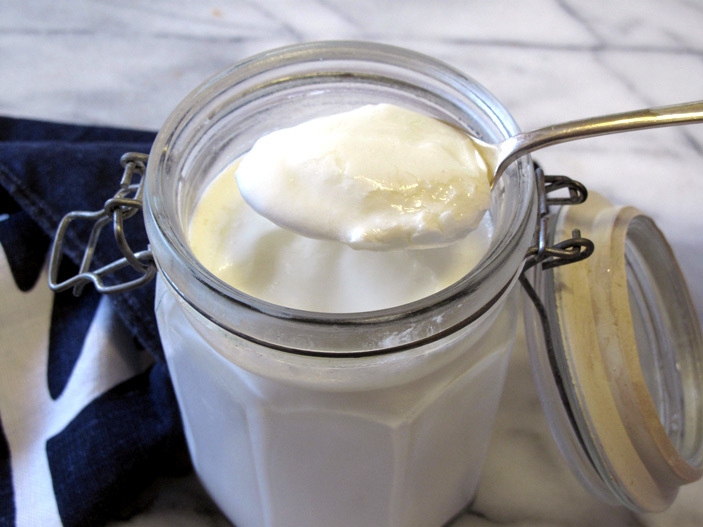 Sophia gave me the cutest little white enamel bucket full of Laban – a thick Lebanese yoghurt she had made herself. Sophia writes an innovative article each month in Crush, my online digital magazine. Called 4 ways with… her next offering is Milk. April is such a wonderful time in Portugal. In a country that is so steeped in the tradition of wine, and where vineyards are within a short drive of your home, unless you have vines on a trellis over your driveway! Many Portuguese families grow their own grapes and make wine each year. The vines are covered in lime green buds and the single rows up on the slopes above the Douro River, large vineyards in the Alentejo and Dao, are a sight to behold. And the food is just fabulous. Especially the fish and seafood. Lampreys are in season – if you can bring yourself to eat lamprey! The cured meats of the pata negra – the black footed pig – are legendary as are the hams of Braga up north of the Douro River. The cheeses, quite often made from sheep’s milk almost seem to be made to go with the wines produced on the same region. Queijo Serra da Estrela is made in the highest mountains in mainland Portugal, The Mountain of the stars, and has been granted Protected Designation of Origin. It is made from November to March. Interestingly the milk is curdled using a local cardoon thistle, a relative of the globe artichoke. I enjoyed eating this cheese hugely. At times it is popped into the oven and the interior goes all soft and utterly and deeply delicious. A traditional accompaniment with cheese is a thick, almost cheese- like paste made from quinces called marmelada, marmelo being Portuguese for quince and the provenance of the word marmalade. In fact marmalade was made from quinces before oranges. But my all time favourite Portuguese national dish, if dish it could be called is the pastel de nata. A little custard tart in a puff pastry shell, sprinkled with cinnamon sugar when it comes out of the oven. Made originally by nuns in the Jeronimo Monastery in Belem, Lisbon that closed down in 1820. 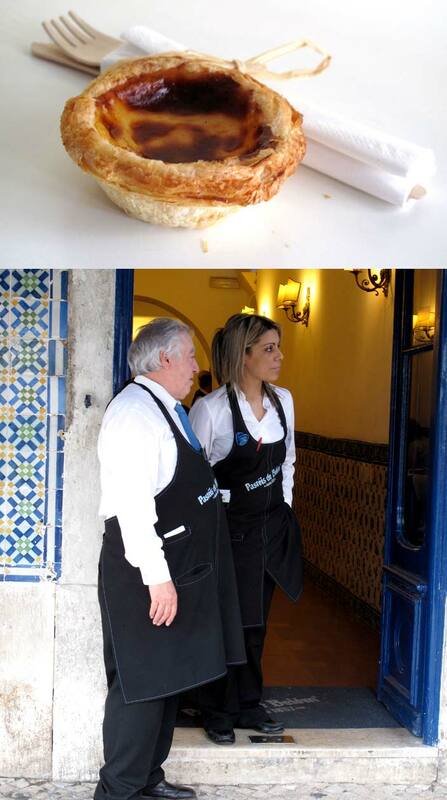 The Pasteis de Belem opened in 1837 and has been making these yummy little pastries ever since. Customers line up for them each day. Inside the place has the same feel of Fortnum and Mason or the Harrod’s Food Hall. Pastries are wrapped for people to take home round the corner or across the world. The good news for us South Africans is that we have a large population of Portuguese origin and that the pastel de nata is not something of which we dream, but which we can buy and taste and enjoy. I wanted to write about De Wet Viljoen’s sublime Neethlingshof Sauvignon Blanc 2010. And then last night I bumped into him at the presentation ceremony for the Top 100 South African Wines where he walked away with a certificate for his Neethlingshof Owl House Pinotage 2009 – appropriate that it should be a South African grape variety for the first Top 100 competition. 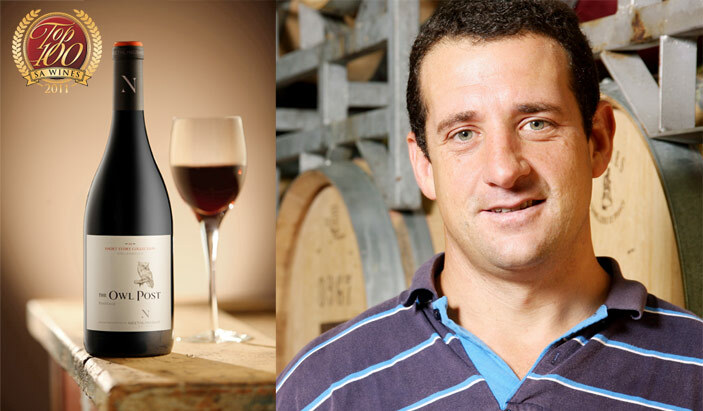 De Wet has a special affinity for this indigenous wine grape and is deputy chairman of the Pinotage Association. ”It is a tremendous source of pride to see Pinotage featured in the collection,” he said after receiving his award. 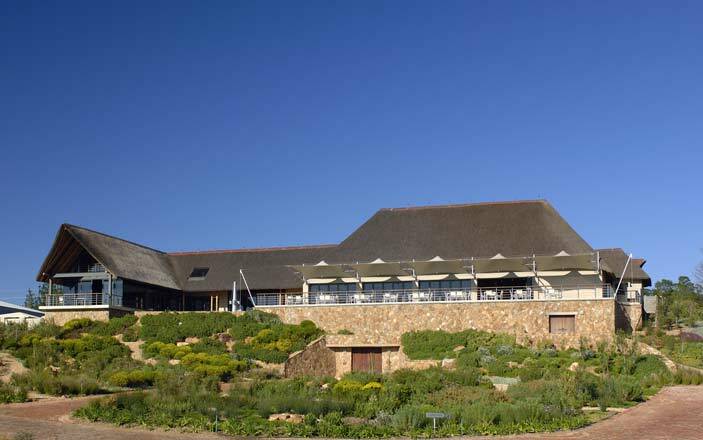 Named the Owl House as Neethlingshof has put owl posts strategically dotted around the vineyards of the Stellenbosch estate and that form part of its integrated pest management programme. The idea of assembling the country’s top wines to highlight South African wine excellence while providing an authoritative reference point for winelovers globally was conceived by local entrepreneur Robin von Holdt who owns the wonderful Rodwell House in Kalk Bay. The panel of high-profile palates who performed the judging a couple of weeks ago was chaired by British wine critic Tim Atkin. The panel included Greg Sherwood and Jamie Goode, also based in the UK, as well as Jennifer Simonetti-Bryan from the US, Sam Harrop from New Zealand and Cathy van Zyl a South African member of the Institute of Masters of Wine. Others on the panel were local winemakers Duncan Savage of Cape Point Vineyards, Richard Kershaw of Mulderbosch, and internationally trained sommelier Guy Harcourt-Wood. Those wines to make it into the line-up are featured in the first edition of the Top 100 SA Wines consumer guide together with tasting and cellaring notes. An excellent little book which is going to be generally available from about May 6th. Oh yes – The Neethlingshof Sauvignon Blanc 2010! Well it’s all about tropical fruits, and has the green flavours of a cooler climate Sauvignon, figs and fresh cut herbs. Zippy and alive and mouthfilling. So you got two wines instead of one! This was the cake of my childhood, there was almost always one in a tin in the pantry and we were given a slice at teatime. The preparation was somewhat of a ritual with my grandmother. The cake tin was always prepared the night before and all ingredients were left on a marble shelf in the pantry to come to room temperature. The cake was made in a large brown Doulton bowl and the wooden mixing spoon was quite worn away on the one side from the frequent creaming and mixing. The whole process was a manual one, no electric beaters or mixers in her kitchen! The glace pineapple and sultanas were bought at Wellington Fruit growers in Darling Street in Cape Town. The pineapple was at times replaced with candied citrus peel that was bought in big chunks and then chopped fine. As an added piece of luxury when we were having guests over the weekend, the top of the cake can be studded with skinned whole almonds. 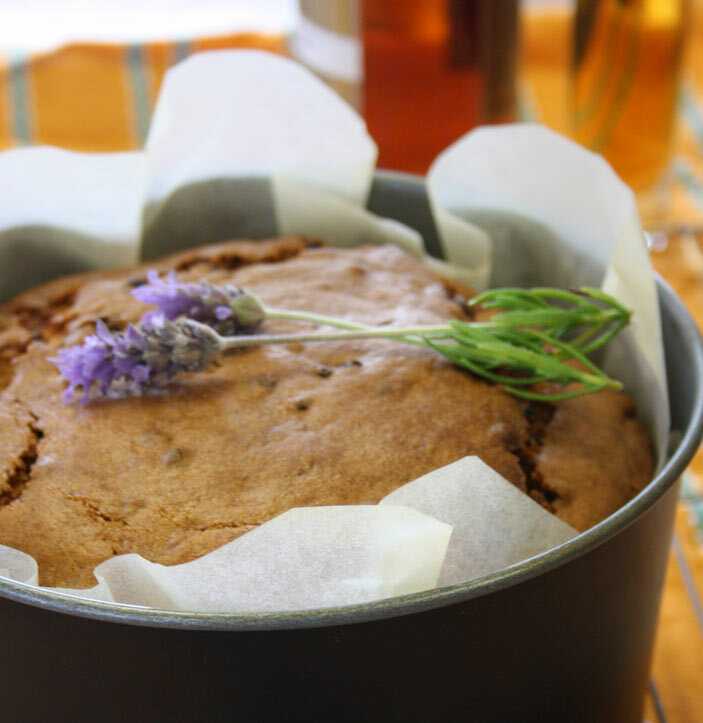 Prepare the cake tin by greasing well and lining with a double layer of greaseproof paper. Preset the oven to 180C. Beat the butter to cream it, add the orange rind and slowly add the sugar until the mixture is light and fluffy. Sift together twice the flour and salt, this adds extra air and thus lightness to the cake. Beat the eggs in a teacup to break them up. Add the egg mixture, one third at a time with a generous spoonful of the flour mixture to prevent curdling. Fold in the remaining flour. [Up to this stage, this can be done in a food processor.] Toss the fruit in a little extra flour and fold into the mixture with enough milk to moisten. Finally fold in the flavouring extract. Bake for about 90 minutes and up to a further 30 minutes or until a skewer inserted into it comes away clean. When done, allow the cake to cool on the tin for a short while and then turn it out onto a cake rack and allow to cool completely. The cake was then usually wrapped in muslin cloth which had been moistened with a sprinkle of brandy which my father used to buy as part of his annual wine and spirits quota from KWV.